TWO PEOPLE WHO were seriously injured in a knife attack at Amsterdam’s Central Station are US citizens, the US ambassador has said, as Dutch police probed a possible terror link. “We are aware that both victims were US citizens and have been in touch with them and their families,” Pete Hoekstra said in a statement. 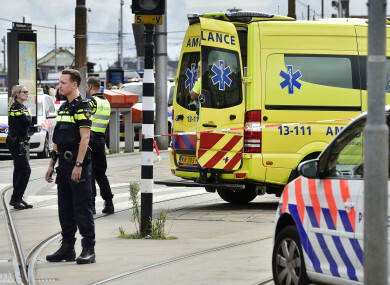 Panic broke out at the Dutch capital’s main station shortly after midday yesterday when the knife-wielding man stabbed two bystanders before he was shot and wounded by police. A preliminary investigation revealed that the assailant did not know his victims and that he did not specifically target them, the police spokesman said – suggesting a random attack. An Amsterdam police spokesman, Frans Zuiderhoek, told AFP late yesterday “we are seriously taking into account that there was a terrorist motive”. Another police spokesman, Rob van der Veen, said today that “the police investigation is in full swing and we are looking at all angles”. Hoekstra said the US is ready to “assist as appropriate, with our main priority as always being the safety and well-being of US citizens in the country”. The attack comes a day after an announcement by Dutch anti-Islam politician Geert Wilders that he was cancelling moves to stage a cartoon competition to caricature the Prophet Mohammad, a plan that had angered many Muslims. Witnesses described scenes of panic yesterday as gunshots rang out and thousands of commuters and tourists were evacuated from the rail terminus shortly after midday. “The two people are very badly injured, and they were brought to the hospital,” said Van der Veen. Police today said they are in a satisfactory condition. Police declined to comment when asked whether there was a possible link between Friday’s attack and the cartoon competition. Wilders’ controversial announcement has seen angry protests, particularly in Pakistan and Afghanistan. Afghan Taliban spokesman Zabihullah Mujahid issued a statement, calling on Muslims to attack Dutch troops and calling Wilders’ plan “a hostile act by this country (the Netherlands) against all Muslims”. Earlier this week, police arrested another man – believed to be Pakistani– at The Hague’s Central Station after he posted a film on Facebook saying he was planning to assassinate the blond-haired Wilders, well known for his virulent anti-Islamic views. Wilders on Thursday said he was cancelling plans to stage the competition to “avoid the risk of making people victims of Islamist violence”. Yesterday, police quickly arrived at the scene with video images showing police ordering the suspect in English to “stay down” after he had been shot. Two platforms at the station – located in the Dutch capital’s historic canal-ringed city centre – had been evacuated and closed off to passengers, police said, and were reopened for rail traffic two hours later. Email “Two people seriously injured in Amsterdam train station stabbing are US citizens, ambassador says”. Feedback on “Two people seriously injured in Amsterdam train station stabbing are US citizens, ambassador says”.